[fh2]Forza Horizon 2: Mazda MX-5 Car Pack Trailer; CONTEST! 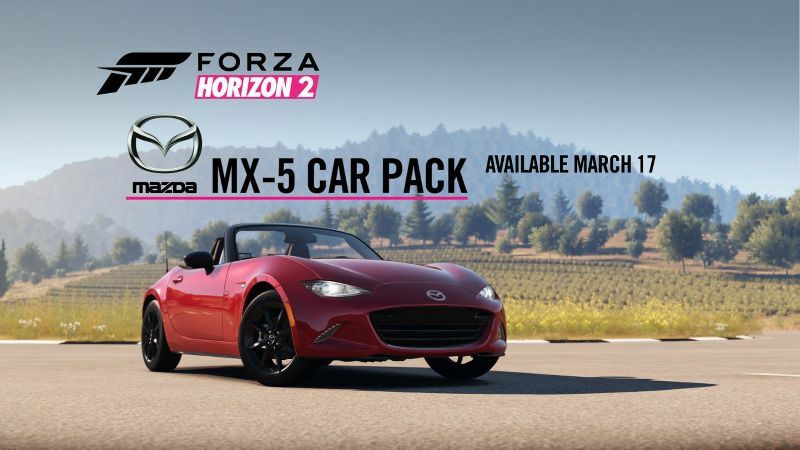 Forza Horizon 2 - Mazda MX-5 Car Pack -Trailer AND MAZDA CONTEST! I GET MY MAZDA MIATAS!!!!!!!!!!!!!!! Microsoft and Mazda are also hosting a contest in which players can win their very own 2016 Mazda MX-5 Miata via the The Rivals contest. Go Here for details! It starts on March 17 and ends on April 30 with the winner needing to best others in the Mazda MX-5 Challenge. The latest car pack arrives on Xbox One March 17. Hi Racers, below I will post the official rules to the contest for your convenience. By entering the Xbox Live and Mazda and “Forza Horizon 2” Time Trial Rivals Contest (“Contest”) you (or, if a minor in your place of residence, your parent or legal guardian on your behalf) agree to abide by all terms and conditions referenced in these Official Rules. 1) ELIGIBILITY: This Contest is only open to legal residents of the fifty (50) United States (including the District of Columbia), 18 years of age or older at the time of entry, and have an Xbox Live Gold or free membership in good standing at the time of entry and have access to an Xbox One console and the “Forza Horizon 2” game (the “Game”) as of 11:59 p.m. ET (“Eastern Time”) on March 16, 2015. Employees of Microsoft Corporation (“Microsoft”) (“Sponsor”), Mazda Motor of America, Inc. (“Mazda”), Mazda dealerships, GMR Marketing LLC (“GMR”), and any promotion or other vendor agency involved in this Contest (and any other person engaged to work on this promotional program) and each of the above’s respective affiliates and the household and immediate family members (defined for the purposes of this Contest as a parent, spouse, child, and sibling) of such employees are not eligible to enter or win. Contest is subject to all federal, state, and local laws and regulations. Void where prohibited or restricted by law. 2) TIMING: This Contest begins at 1:00 p.m. ET on March 17, 2015, and ends at 11:59 p.m. ET on April 30, 2015 (“Contest Period”). a) Download the free available Mazda Car Pack (the “Car Pack”) by navigating to the Mazda landing page and clicking the designated link to navigate to the Xbox Live Marketplace and complete the download. b) Register by navigating to the Mazda landing page and clicking the designated “Race Now” button. 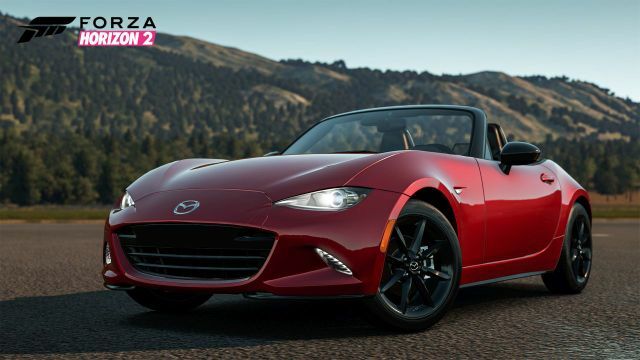 c) Play the “Forza Horizon 2” game in Rival Mode using the 2016 Mazda MX-5 vehicle from the Car Pack (the “Designated Car”) in the Mazda MX-5 Challenge Rivals event on the Sisteron Perimeter Sprint Track (the “Designated Track”) and attempt to achieve your fastest race time (the “Race”). i) Entrants may not tune or modify the Designated Car in any way. You can race the Designated Track as often as you wish and your fastest Race from among all of your Races during the Contest Period will be determined as your Official Contest Time. The use of automated devices to enter this Contest is prohibited. Receipt of entries will not be acknowledged. Sponsor, Mazda, Mazda dealerships, GMR, and any promotion or other vendor agency involved in this Contest (and any other person engaged to work on this promotional program) and each of the above’s respective affiliates (collectively, the “Released Parties”) are not responsible for lost, late, illegible, stolen, incomplete, invalid, unintelligible or misdirected entries, which will be disqualified, or for problems of any kind whether mechanical, human or electronic, including any computer, online, telephone, or technical malfunctions that may occur. Proof of submission will not be deemed to be proof of receipt by Sponsor. ii) Updating Account Information: Potential winners will be contacted using the contact information tied to the Xbox Live Gamertag used to earn an entry. Your Xbox Live Gamertag profile information, including e-mail address, mailing address, and phone number, must be complete, correct and current in order to be eligible for a prize. You can verify/update your profile information via your account profile by following the instructions on Xbox.com or through the Xbox Live Dashboard from your Xbox One console. 4) FINALIST DETERMINATION: This is not a game of chance. Odds of winning depend on the number and quality of entries received. Two (2) potential Finalists will be determined based on the Races with the fastest Official Contest Times from among all eligible entries received during the Contest Period. In event of a tie among entrants, the entrant(s) who ran their Official Contest Time Race first will be determined as the Finalist(s). If a Finalist is disqualified for any reason, the entrant with the next fastest Official Contest Time will be determined as the Finalist. Limit one (1) Finalist designation per entrant. a) Finalist Notification and Confirmation: Potential Finalists will be notified by phone using the phone number indicated on each potential Finalist’s Xbox Live account profile on or about May 8, 2015. The potential Finalists must respond via phone within twenty four (24) hours of notification or the potential Finalist will be disqualified. Potential Finalists will be required to complete an Affidavit of Eligibility, Liability/Publicity Release, Background Check Authorization Form and appropriate tax documents (the “Documents”) within three (3) calendar days of delivery of the Documents or the Finalist designation and prize will be forfeited and another potential Finalist may be determined, time permitting. i) Background Check: Potential Finalists may be subject to a criminal background check (which may include, without limitation, a review of the driving record) before being declared a Finalist. Any conduct or criminal background inconsistent with Sponsor’s reputation or inconsistent with the goals of the Contest (including without limitation, based on driver history or record, any drug or alcohol dependency or treatment, criminal arrests or convictions, law suits—either settled or still pending), as determined solely by the Sponsor, may be grounds for disqualification. ii) Sponsor has the right but not the obligation to require the Finalists to make one or more personal appearances at a time and location during the Event as selected by Sponsor for a satellite media tour, video news release and/or any other public relations activity. Finalists shall conduct him/herself in a professional manner at all times during such personal appearances, and shall not be under the influence of drugs or alcohol at any time during such appearances. Finalists agree to permit the use of his/her name, likenesses and/or identifying information for promotional, publicity or advertising purposes in any and all media now known or hereafter devised, including print and online media, without time or geographic limitations and without additional notification, compensation or permission, unless prohibited by law. Notwithstanding any of the above, Sponsor’s sole obligation is to award the Finalist with the Finalist Prize outlined in the “Prize” Section of these Official Rules. Sponsor will have no obligation for further compensation. Sponsor will have no obligation to use the Finalists’ services or names or likenesses in any manner whatsoever. In the event the Finalist fails to abide by the Rules, he/she will forfeit the entire Finalist Prize and the entrant with the next highest Official Contest Time will be deemed the Finalist, time and circumstances permitting. iii) Finalists’ Guests: Each Finalist must designate one (1) guest within three (3) calendar days of delivery of the Documents. The guest must be 18 years of age or older. In addition, at the same time as the Finalist completes his/her Documents, the guest must sign and return a Publicity Release and a Liability Release. iv) Publicity Release: Entrants further grant to Sponsor and Mazda the right to use and publish their proper names, states, Xbox Live Gamertags, and gameplay online, in print, and in any other media in connection with the Contest. Acceptance of a prize constitutes permission for Sponsor and Mazda to use the Finalists’ and Grand Prize winner’s names and likenesses for advertising and promotional purposes without notice, review, approval or additional compensation unless prohibited by law. 5) GRAND PRIZE WINNER DETERMINATION: The Finalists will participate in an in-person Grand Prize winner determination racing competition (the “Event”) held in Los Angeles, California, on or about June 17, 2015. At the Event, the two (2) Finalists will compete head-to-head in one (1) race by playing the “Forza Horizon 2” game in Rival Mode using the Designated Car on the Designated Track. Entrants must use the Xbox One console(s), controllers, Xbox Live Gamertags and all other equipment provided by the Sponsor and may not tune or modify the Designated Car in any way. The Finalist who achieves the fastest race time will be determined as the Grand Prize winner. In the event of a tie, a tie-breaker race will be held. If the Grand Prize winner forfeits prize or declines prize, the other Finalist will be deemed the Grand Prize winner, time and circumstances permitting. 6) PRIZES AND APPROXIMATE RETAIL VALUES: Prizes in the Contest will be awarded as follows. Limit one (1) Grand Prize and one (1) Finalist Prize per person. a) One (1) Grand Prize: One (1) 2016 Mazda MX-5 (vehicle features and all other aspects of the vehicle are at the sole discretion of the Sponsor). The Approximate Retail Value (“ARV”) of the vehicle is $30,000. Final Manufacturers’ Suggested Retail Price (MSRP) has not been finalized. The Grand Prize winner will also receive a single cash payment of $15,454.55 in the form of a corporate check, which is based on a 34% tax rate and is intended to assist with any federal or state tax obligations related to the Grand Prize. Any additional tax obligation that the Grand Prize winner may be liable for is the sole responsibility of the winner. The Grand Prize winner is responsible for all federal, state, and local income taxes and other taxes associated with the prize. The ARV of the Grand Prize is $45,454.55. Vehicle packages, including make and model, and interior and exterior colors will be selected solely by the Sponsor. Grand Prize does NOT include as part of the prize vehicle options, taxes, fees, title costs, registration, and insurance. Vehicle awarded in a state with CARB or other emission standards will comply with those standards. Grand Prize winner must have a valid driver’s license, and satisfy applicable proof-of-insurance laws to take delivery of Grand Prize, Grand Prize winner must take delivery of vehicle within twelve (12) weeks of notification at a location designated by the Sponsor or its agents; failure to do so may result in forfeiture of the prize. Sponsor will not provide any additional verbal or written warranties other than the standard written warranty statement provided with the vehicle. Sponsor reserves the right to substitute a vehicle for the Grand Prize of the same approximate retail value. Sponsor will not provide any additional verbal or written warranties other than the standard written warranty statement provided with the vehicle. Sponsor reserves the right to substitute a vehicle for the Grand Prize of the same approximate retail value. Accessories and options may vary, including interior/exterior color (subject to availability). Accessories are subject to change without notice. Sponsor reserves the right to change product specifications at any time without incurring any obligations. All options and upgrades on vehicle are the sole responsibility of the Grand Prize winner. The Grand Prize winner is not eligible for any cash back or rebate which may be available on the vehicle at time of delivery. The Grand Prize winner is solely responsible for all travel transportation costs for collecting prize, as well as any dealer prep, emissions inspection, gasoline, vehicle maintenance, and any other costs incurred in claiming, registering, or using the prize including without limitation, any costs incurred in bringing the vehicle from the delivery site to the Grand Prize winner’s home. The Grand Prize winner must take delivery of vehicle at a location designated by the Sponsor or it agents within twelve (12) weeks following the determination of the Grand Prize winner. Ability of Sponsor to deliver the Grand Prize vehicle to the Grand Prize winner is subject to any state, federal and local laws, rules and regulations related to vehicle holds, recalls, and similar actions. b) Two (2) Finalist Prizes: A trip for the Finalist and one (1) guest to the Event in Los Angeles, California June 16, 2015 through June 18, 2015. Trip consists of: Round-trip, coach-class airfare for Finalist and one (1) guest; two (2) nights’ hotel accommodations (hotel to be determined at the sole discretion of the Sponsor, in one (1) double-occupancy room, excluding room service, meals, and other incidentals); ground transportation to and from the airport and hotel for Finalist and one (1) guest, and to and from the hotel and Event for Finalist and one (1) guest; admission to the Event (all aspects of admission is at the sole discretion of the Sponsor); and $450, awarded in the form of a corporate check to the Finalist only. The ARV of each Finalist Prize is $4,110. Airline carrier’s regulations and conditions may apply. Trip may not be combined with any other offer and travel may not qualify for frequent flyer miles. Each Finalist and his/her guest must travel together on the same itinerary. Finalist and his/her guest must possess any necessary valid travel documents (i.e., valid government-issued photo ID) in order to travel. Any change made by the Finalist or guest to the travel itinerary, including any cost implications, is the Finalist’s sole responsibility. No refunds or credit for changes are allowed. All other expenses and costs, not expressly listed above, including, but not limited to, tips, entertainment, transfers, and transportation to and from Finalist’s home residence are the Finalist’s sole responsibility. These are estimated values only. The actual value of the Finalist Prize is expected to vary, based on the point of origination, airfare fluctuations, and hotel pricing. If the actual value of the travel portion of prize is less than stated, difference will not be awarded in cash, and no such claim will be honored. If the Finalist resides within 300 miles of the travel destination, alternate travel arrangements may be made by the Sponsor and the Finalist Prize and value of prize adjusted accordingly. Each Finalist must plan trip with Sponsor and travel must be completed between June 16, 2015 and June 18, 2015, or the Finalist shall forfeit the Finalist Prize in its entirety and an alternate winner will be selected, time permitting. Dates of departure and return, travel route, seat selection, hotel accommodations, activities, and all elements of the Finalist Prize will be arranged by the Sponsor, in its sole discretion, and are subject to availability and/or change. c) Approximate Retail Value of all prizes combined: $53,674.55. Prizes are not redeemable for cash. No substitution, transfer, or assignment of prize permitted, except that Sponsor reserves the right to substitute a prize of equal or greater value. Any and all federal, state, and local taxes related to a prize are solely the responsibility of the winner and Mazda will issue Form 1099 to each recipient for the final values, including the 34% received for tax payments. All other expenses not specified as part of prize description are solely the winner’s responsibility. g) agree that you have no right to use the copyrights, trademarks, or other intellectual property relating to the Designated Cars outside the Contest. Please note that following the end of this Contest your Submission may be posted on a website selected by the Released Parties for viewing by visitors to that website. The Released Parties are not responsible for any unauthorized use of your Submission by visitors to this website. While the Released Parties reserve these rights, the Released Parties are not obligated to use your Submission for any purpose, even if it has been selected as a winning Submission. If you do not want to grant the Released Parties these rights to your Submission, please do not enter this Contest. 8) ADDITIONAL TERMS: By entering, entrant agrees to accept and abide by the Official Rules of this Contest and agrees that any dispute with regard to the conduct of this Contest, rule interpretation, or award of prize, shall be resolved by Sponsor, whose decision shall be binding and final. By entering, entrant agrees to be notified using the contact information provided in the entrant’s Xbox Live account profile by the Sponsor and/or GMR for the purposes of the administration of this Contest. This Contest is governed by the laws of the State of Washington, and entrant consents to the exclusive jurisdiction and venue of the Courts of the State of Washington for any disputes arising out of this Contest. All federal, state, and local laws and regulations apply. By participating, entrant agrees to release and hold harmless the Released Parties from any injury, loss or damage to person, including death or property damage due in-whole or in-part, directly or indirectly to the acceptance, use, or misuse of a prize, participation in any Contest-related activity, or participation in the Contest. The Released Parties are not responsible for any typographical or other error in the printing of this offer, administration of the Contest or in the announcement of prizes, including such error as may give an erroneous indication that a prize has been won. In the event the Sponsor is prevented from continuing with this Contest, or the integrity and/or feasibility of the Contest is undermined by any event including but not limited to fire, flood, epidemic, earthquake, explosion, labor dispute or strike, act of God or public enemy, satellite or equipment failure, riot or civil disturbance, war (declared or undeclared), terrorist threat or activity, or any federal, state, or local government law, order or regulation, order of any court or jurisdiction, or other cause not reasonably within the Sponsor’s control (each a “Force Majeure” event), the Sponsor shall have the right, in its sole discretion, to abbreviate, modify, suspend, cancel, or terminate the Contest without notice or further obligation. If the Sponsor, in its discretion, elects to abbreviate the Contest as a result of a Force Majeure event, the Sponsor reserves the right, but shall have no obligation, to randomly select and/or execute the judging process to determine the winner(s) from among all valid and eligible entries received up to the time of such Force Majeure event. 9) INTERNET: If for any reason the Internet portion of this Contest is not capable of running as planned, including infection by computer virus, bugs, tampering, unauthorized intervention, fraud, technical failures, or any other causes beyond the control of Sponsor which corrupt or affect the administration, security, fairness, integrity, or proper conduct of this Contest, Sponsor reserves the right, at its sole discretion to disqualify any individual who tampers with the entry process, and to cancel, terminate, modify, or suspend this Contest. In any such event, Sponsor, at its sole discretion, will randomly select and/or execute the judging process to determine the winner(s) from eligible, non-suspect entries received prior to the event requiring such termination, suspension or cancellation. The Released Parties assume no responsibility for any error, omission, interruption, deletion, defect, delay in operation or transmission, communications line failure, theft or destruction or unauthorized access to, or alteration of, entries. The Released Parties are not responsible for any problems or technical malfunction of any telephone network or lines, computer online systems, servers, or providers, computer equipment, software, failure of any email or entry to be received by Sponsor on account of technical problems or traffic congestion on the Internet or at any Web site, or any combination thereof, including any injury or damage to participant’s or any other person’s computer related to or resulting from participation or downloading any materials in this Contest. CAUTION: ANY ATTEMPT TO DELIBERATELY DAMAGE ANY WEB SITE OR UNDERMINE THE LEGITIMATE OPERATION OF THIS CONTEST MAY BE A VIOLATION OF CRIMINAL AND CIVIL LAWS AND SHOULD SUCH AN ATTEMPT BE MADE, SPONSOR RESERVES THE RIGHT TO SEEK DAMAGES TO THE FULLEST EXTENT PERMITTED BY LAW. Entries made by Internet will be declared made by the authorized account holder of the email address submitted at time of entry. “Authorized account holder” is defined as the natural person who is assigned to an email address by an Internet access provider, online service provider or other organization (e.g., business, educational, institution, etc.) that is responsible for assigning email addresses for the domain associated with the submitted email address. 10) USE OF DATA: Any personal data relating to entrants will be used in accordance with Microsoft’s Privacy Statement, which is located at go.microsoft.com/fwlink/?LinkID=259655 and these Official Rules. Please note that by entering, you are accepting these Official Rules and the terms of the Privacy Statement. Entrants’ data will be used by the Released Parties and their representatives, employees, or third-party vendors for the use and purposes to execute the Contest as provided in these Official Rules. 11) WINNERS LIST: The names and/or Xbox Live Gamertags of any major prize winners (prizes valued $25 or greater) will be available via e-mail. To request a winners list for this Contest, draft an e-mail with the subject line “Winners List-Xbox Live and Mazda and “Forza Horizon 2” Time Trial Rivals Contest” and send it to winners@xboxpromotions.com. This list will be available for at least thirty (30) days after June 12, 2015. 12) SPONSOR: This Contest is sponsored by Microsoft Corporation, One Microsoft Way, Redmond, WA 98052. 13) ADMINISTRATOR: This Contest is administered by GMR Marketing LLC, 5000 South Towne Drive, New Berlin, WI 53151.